First, have you taken advantage of the Paint and Prose Buy 2 Get 1 FREE flash sale? You still can through midnight today! Our prints make great gifts! 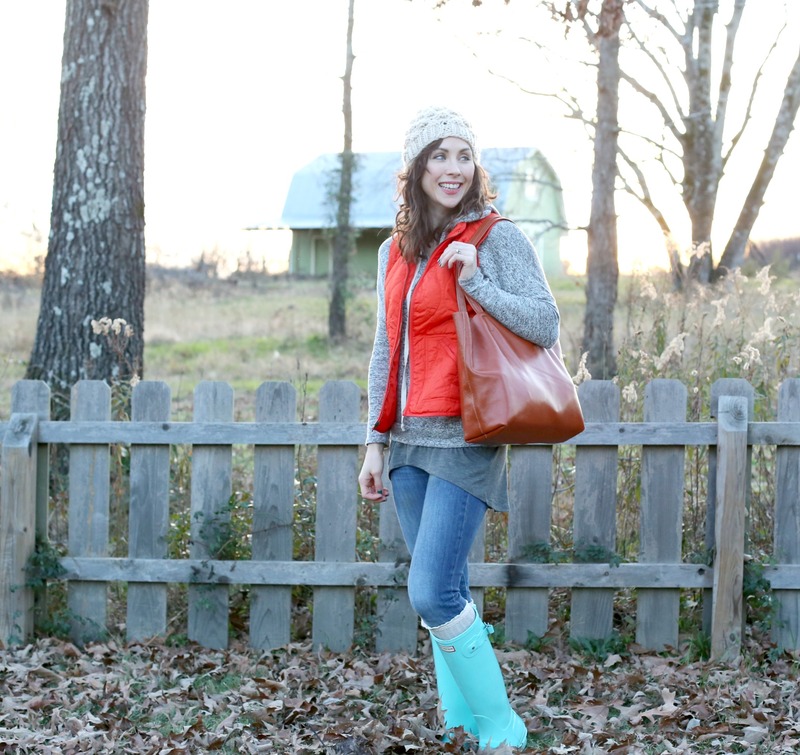 I’ve been ogling the Madewell Transport Tote for nigh on 3 years now. I just never could bring myself to pull the trigger to spend $180 on an unstructured leather bag (or…any bag, actually). Don’t get me wrong. I love it. It’s beautiful, and it holds tons of stuff. I’ve lovingly fingered them in stores and admired them on the arms of friends. I just…couldn’t do it. I’ve even stalked ebay for a bargain but never found a better deal than $100 for a used one with oodles of stains and scratches (I guess there’s that to be said–they hold their value!). I’d all but given up my search until I typed “Madewell Transport” into the search bar on Amazon, and the Damero Tote popped up. I was intrigued. It looks really similar to the Transport, and the reviews consistently praise the quality of the leather and durability of the construction. But it’s only 1/3 of the cost. Now, I had some Amazon gift card moolah to spend, so the purchase was a no-brainer. But, now that I’ve had the chance to carry the purse in real life, I can happily say that I think it’s worth every penny of the $60 I spent, and I would buy it even if I didn’t have a gift card. And, no, this is not a sponsored ad (although, the post contains affiliate links that give me a teeeny percentage if you purchase). I just thought any fellow cognac leather simple bag lovers might want to know that there’s a beautiful, high-quality alternative to the name-brand popular versions out there. I’m not going to do a full-blown, nitty gritty review of every feature, but I will do a quick run-down of the pros and cons in my experience so far. The leather is very much real. It’s a rich milk chocolate brown with a beautiful grain and a buttery soft finish. No stiffness or starchiness here. 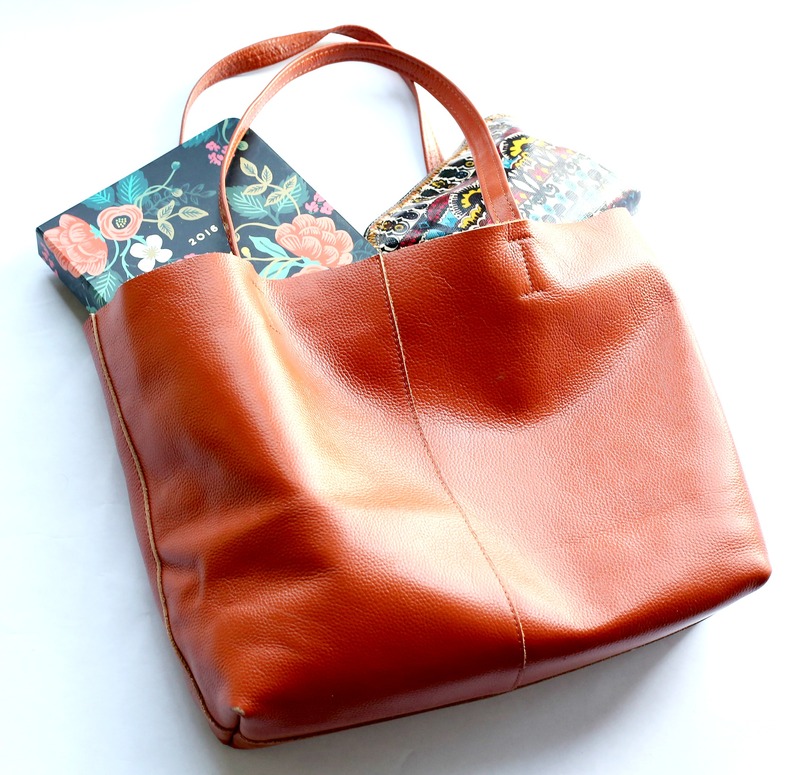 And it doesn’t scuff or stain easily (I should know; I’m hard on my bags). It holds tons, without feeling ridiculously huge/bulky. 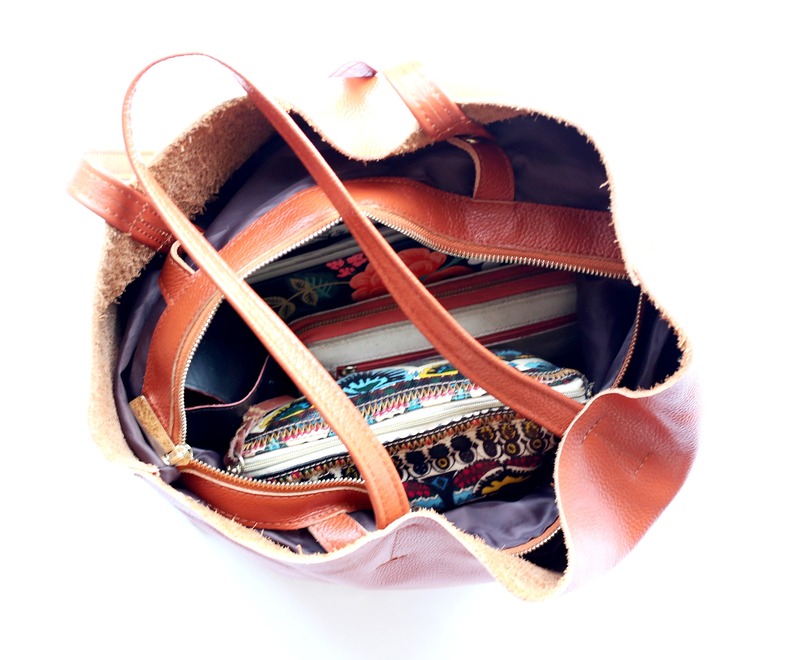 After my “what’s really in my bag” post, you already know that I carry a little bit ‘o everything with me. Well, I am pleased to say that I have cleaned/organized up my act considerably (you won’t find a random belt or still-packaged Chick-fil-a toys in there anymore), but I am still toting around a planner, notebook, wallet, coupon pouch, makeup bag, BODYPUMP/COMBAT choreography notes, diapers, wipes, a water bottle, and various other sundries, and there’s still room for (a bit) more. There’s a removable insert, which helps keep the bag clean. It’s not quite as big as the rest of the bag, which creates pockets between the insert and the actual leather of the bag, but I like it because I put things like diapers and wipes and stuff in the in-between section, which makes it another (albeit unintentional) organizational compartment of its own. The straps have a good drop-length. They don’t hike up under your arm in some sort of weird armpit choke hold, but neither are they so long that they’re continually slipping. The stitching is very, very sturdy (see above comments about my hardness on my bags and how much I stuff in there). 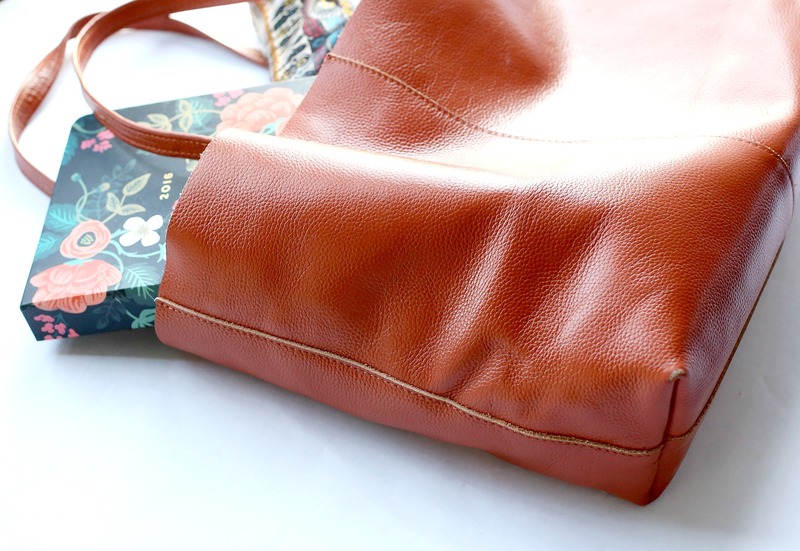 I really only have one, but it’s kind of a big one–the snaps that hold the lining onto the leather outer are too weak and tend to pull loose, thus causing the lining to sag down into the purse’s exterior when they come undone. It’s a little annoying, especially if you’re holding a baby and trying to stuff something in your purse, and you snag one of the snaps, and everything sort of collapses on you. But ultimately, the snaps are easy to refasten, and the openness of the purse’s design insures that you can still find things, even when one of them has pulled loose, so even though I wish they had made the snaps of sturdier stuff, it’s far from a deal breaker for me. The lining is smaller than the purse. I already mentioned this, and I already said that, for me, it’s actually more of a plus, since it creates more compartments, but someone else might not like this. I’m grateful that there are 3 small pockets (one of them zippered) for my small items like keys/gum, etc., but I wish they were made of something more substantial than the silky synthetic material that the insert lining is made up of. It would make it easier to slide items inside without tugging on the snaps, thus resulting in Con #1. I still can use the pockets pretty easily, and I’m grateful to have them, so overall, it’s no big thing. Aaaaand there you have it, folks. 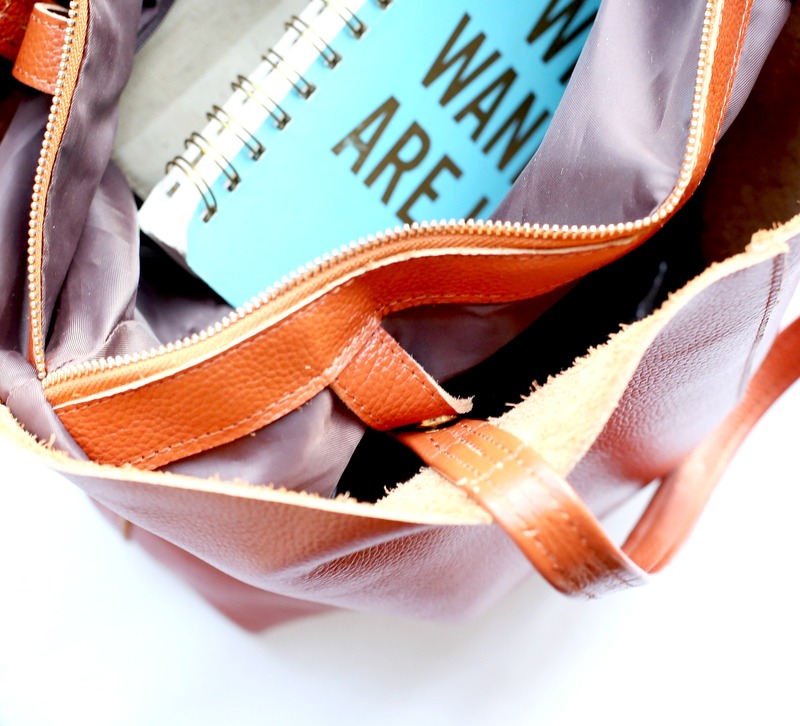 My very honest opinion of a purse that I really love, despite its flaws (which, when I think about it, is how I feel about my three-year-olds at the moment–ha!). I do believe it will serve me well for a long, long time. Hi, which size did you buy? the medium or large? how many inches are not covered with lining? or more easily put, what are the measurements of the removable lining? can i fit a 13” Macbook? the bag is so beautiful!! Thanks much!! 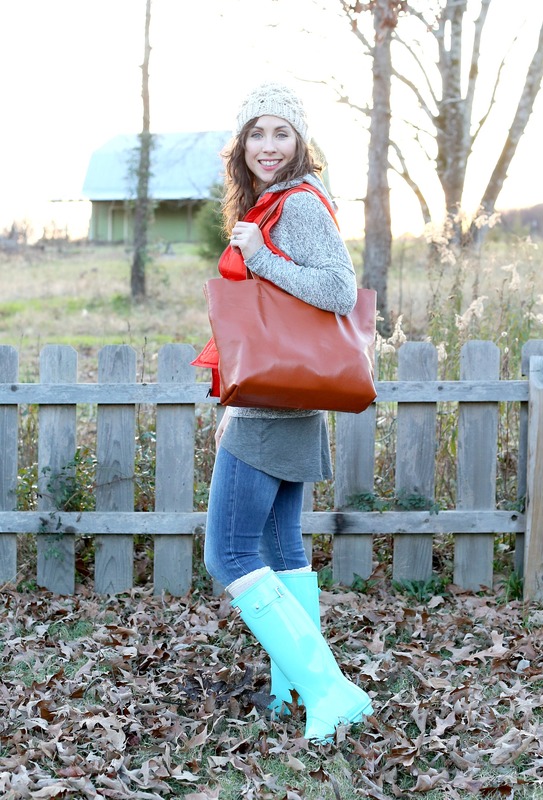 Could you share what size tote this is? Thanks! Since starting a new job, I’ve been in search of a new tote bag (the one I have is not real leather and its a bit small). Everything that I have been looking at is too pricey or just not exactly what I want. This bag probably comes the closest and the price looks great. I think I will get the black one because the tote bag I talked about above and another briefcase/laptop (which I can not find for the life of me, smh!) bag is cognac as well. Thank you so much!! I would love to know about your cute planner!? It’s from Amazon. The brand is Rifle paper co.
Just a tip on the snaps, you can hammer the snap a little bit flatter so it will grip tighter, but just hammer it a teeny bit or you’ll flatten it and it won’t snap shut at all, ask me how I know. So smart! I’ll try it! cute! great find!! I’ve been on the prowl for a brown leather crossbody bag. My husband snagged one for me at Christmas, but after trying it on in person, the strap was just a bit too short and the purse was too small. SO. Still on the lookout. #firstworldproblems, I realize. but if you ever come across a grand one, feel free to post about it.